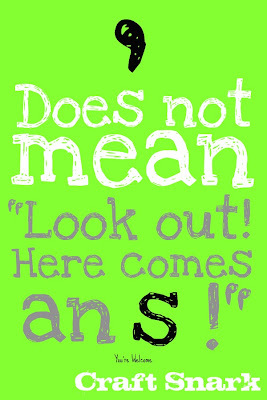 Please, please, please, for the love of all things sacred and grammatical... learn the basics of the apostrophe! I get actual spasms of pain shooting into my brain each time I see the apostrophe used "just because there is an s". Apostrophe does not mean "Look out! Here comes an s!" There is the odd exception because English was designed by people who think it is normal to take courses in your native language for 12+ years in order to be able to get it right. I'm not going to get into those here because as long as you can get this top part right, you'll already be ahead of a lot of people. You're welcome. Now, go be snarky and leave me lots of comments with mis-used apostrophes. Yes, I know you were thinking it.